Enjoy ice cream at our ice cream parlor at 940 Golf N Fun. JOANIE & PETE'S DAIRY KING is a full service ICE CREAM PARLOR and SNACK BAR featuring 18 flavors of Jack N Jill ice cream. Not to forget that we also have soft serve flavors in vanilla, chocolate and twist. Flurries, Waffle bowls, Shakes, Floats, Cookie Cones, Banana Splits and more. We also have over 25 different toppings to choose from to add to your favorite ice cream or sundae. Not only do we stop at ice cream we also have a variety of food from Pretzels, Funnel Fries, French fries, Hamburgers, Mozzarella Sticks and a lot more to munch on. 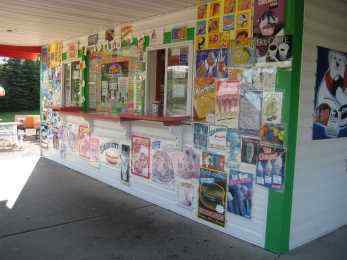 We also have over 50 varieties of Italian Ices, Smoothies and Gelatis. How hungry are you? Try our KITCHEN SINK sundae for $9.95, it includes 8 scoops of ice cream, 4 toppings (of your choice) , Whip Cream and a Cherry. Finish it by yourself and you receive a free game of MINIATURE GOLF. Whatever the craving may be we can satisfy so please stop by today and enjoy a refreshing treat. Our snack bar and ice cream parlor is always sure to satisfy. A day of family fun just wouldn't be complete without a stop at JOANIE & PETE'S DAIRY KING for ice cream, soda, hamburgers or hotdogs.